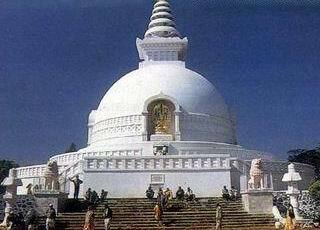 Vishwa Shanti Stupa is a major tourist attraction at Rajgir. Rajgir is a popular pilgrim destination for Buddhists. Nichidatsu Fujii (1885-1985), a Buddhist monk from Japan and founder of the Nipponzan-Myohoji Buddhist sect. Nichidatsu Fujii set an example for world peace through Peace Pagodas. In series of establishing peace pagodas world over he established one such peace pagoda at Rajgir which is called Vishwa Shanti Stupa. A pagoda is a type of stupa which provides equality for worship and gathering at one place for common cause. The Nipponzan-Myohoji sect has been successful in spreading the views of Lord Buddha for peace and harmony among people. These stupa or Japanese Pagoda are excellent example of oriental style of architecture. Though all of the pagodas are not built under the guidance of Nichidatsu Fujji, most of them have been built either under his guidance or under his recommendations. World Peace Pagoda at Rajgir is made of spotless white marble and is a remarkable monument. Vishwa Shanti Stupa is the tallest peace Pagoda in the world standing tall at 400 meters and houses four statues of Lord Buddha on the four side-corners of the stupa. The four statues on four corner-sides of stupa depict the four phases of life of Lord Buddha. These statues are made of gold. These statues depicting, birth, enlightenment, teaching and passing away of Lord Buddha are symbolical of Lord Buddha’s teachings and transient life.